I have a certain affection for the early Märklin Gauge 1 trains. They’re toys, pure and simple, big toys that have a presence. 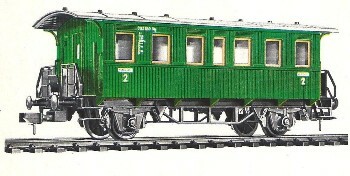 Märklin had been in large scale trains before. Their 0-Scale line was discontinued in the late 1940’s / early 1950’s in favor of their smaller 00 / H0 sized trains, but it was Märklin that had established the notion of standardized sizes of trains. Their early trains ranged from 0 to Gauge I, Gauge II, Gauge III and some very large items were manufactured in Gauge IV. Their Gauge I line was discontinued in the early 1930’s, with the earlier large sized trains being discontinued even earlier. By the late 1960’s, a market for large scale trains began to emerge. In 1968, the firm Ernst Paul Lehman, a toy manufacturer located in Nürnberg, introduced its line of trains called Lehman Gross Bahn (Lehman Big Trains). LGB trains operated on a track gauge of 45mm, that same gauge which Märklin had established in the late 1800’s. LGB trains were different, however, since they were proportioned to a scale of 1:22.5. Earlier Märklin Gauge I trains were proportioned to a scale of 1:32. The Märklin company of the 1960’s was a dominant force in model railroading worldwide, and Mother Märklin felt that it was necessary to produce a large sized model train line, which brings us to the subject of these pages. While the earlier Märklin Gauge I had been stamped metal toys, the new Märklin I was largely plastic in composition. They were still toys, but there was a nod toward realistic representation of German trains. 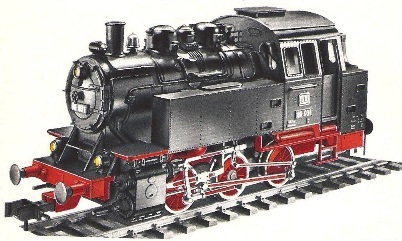 Both locomotives shared a common chassis, with A/C power supplied the standard Märklin 32va transformer to an open frame A/C motor. Reversing direction was handled in the Märklin H0 manner, with a pulse of higher voltage activating a reversing switch in the locomotive. The coupler used in Märklin I is quite similar to the N-Scale “Rapido” coupler, with the addition of a small lever arm to aid uncoupling by hand. The 5500 starter set included the Class 80, a gondola & tipping hopper, with an oval of track and the standard Märklin 30va transformer that was a standard in their H0 line of trains. The Märklin Gauge I track had solid rails mounted on plastic cross ties. There was a basic assortment of track, with curved tracks available in 600mm radius. A pair of switches and a bumper rounded out a modest range of track pieces. 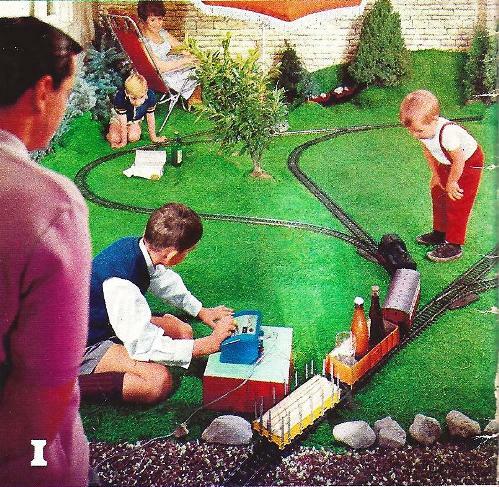 In those early days of the new Märklin I, the emphasis was on play value for children. The freight cars were all open, so that different objects could be loaded onto them and hauled away. The passenger cars had doors which could be opened and roofs that could be removed, so more play value was added. In those early days, Märklin I was a child’s toy, but as time passed, the line would slowly evolve into what it is today. 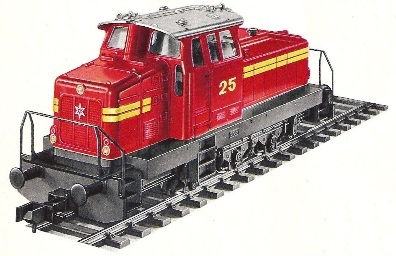 Within a year, Märklin Minex would be gone from the product line, and Märklin I would start to grow. Within four years, Märklin I would have grown somewhat, but the world’s attention would be drawn to the new sensation, Z-Scale. Unlike Minex, however, Märklin I would not go away.